In case you haven't heard, my sweet husband has thrown down the beady gauntlet this year and is issuing me a monthly design challenge... The Honey Do List! Each month may be something totally different... stay tuned to see what he dreams up for me this year! For February he's given me a little dose of spring with a color palette taken from one of his photos. I've finally been going through some of last summer's photos, getting a welcome burst of color in these white-washed snowy months. 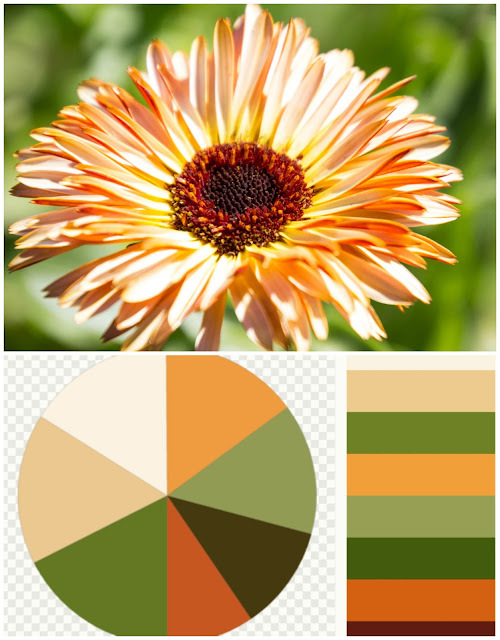 I discovered this shot of a flower (no idea what kind it is) and really liked the greens and earth tones in it. I figured Sarajo would surely have something in this color palette in her giant dragon's hoard of beads! I knew exactly which bead I would use as soon as I opened the files that Eric sent me. 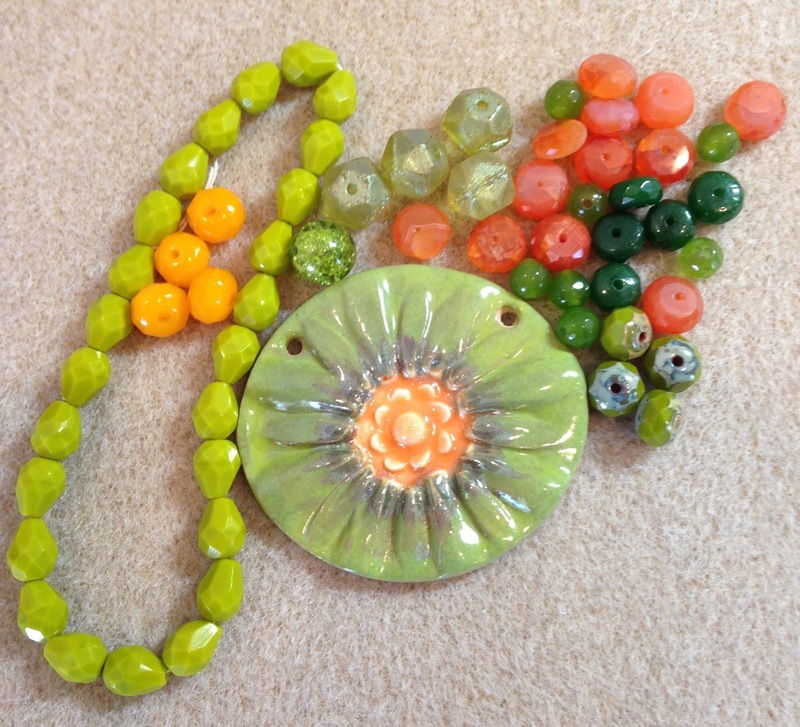 There was no question in my mind at all that it had to be a large green and orange flower pendant that I bought from Tracee Dock of The Classic Bead. This was one of my early purchases from Tracee that I made when we met her on a trip to Kansas City. Starting to pull things together! I started my design with the wire wrapped side. For some reason, that big luster green English cut glass bead just wanted to be on it's own instead of strung with other beads. 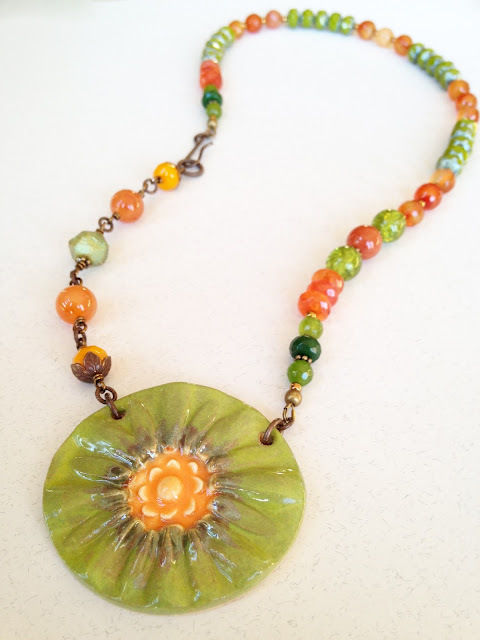 I built it out from there adding in carnelian rounds and some bright tangerine Czech glass to bring out the bright center of the flower pendant. The large carnelian faceted rondelles that I pulled had to be strung due to a small hole size, so I played around with different combinations and patterns until I found something that pleased me. There's no doubt that the finished product is a serious statement piece! On a whim I shared the challenge in a couple of Facebook Groups for jewelry makers. I was thrilled to discover that other folks were excited by the challenge and wanted to play along with me! Stop by and see what everyone else was inspired to make for this month's Honey Do List challenge! I don't know if people will always be interested in joining in the Honey Do List challenge, but next month's just might get creative juices going! (Eric has given me a sneak peek at his March challenge.) Check back here on March 1st to find out what he has in store for me and to see if you want to play along next time! Fabulous! That is a very beautiful pendant you found and your asymmetrical necklace does it justice! I love how it spoke to you and the big English cut bead makes the necklace! Beautiful work as always Sarajo. Thanks for inviting us! Great job Honey! Way to finally use that giant pendant! how fun!! I can see this, this summer with a breezy skirt and tank...a simple but bold statement piece for that pop of color and personality. I was thinking yesterday when working on my stair well to my basement studio how far my house has come since you paid me that visit. I don't think I had been in there very long at that point and was still getting settled. Thanks for sharing and how fun that Eric is involved and taking an interest. Give him my best! I just love working with your creations, Tracee... that's why there are so many of them in my dragon's hoard! Can you believe that trip was May of 2013? Time sure does fly. You were so generous to invite us over and let me paw through your stash... we'll have to do it again sometime. I know we'd love to get back to KC! Beautiful Necklace. Ejoyed the challenge, lol, thank you for letting us play along. Thanks, Gloria! And thank YOU for playing along... so glad you had fun. I always say, the more the merrier! What an encouraging and supportive idea! This must be a real encouragement to you. I'd love to play along some time! Your piece is beautiful & that focal bead is perfect! Don't be fooled... I struggle with asymmetry too! That's why I keep forcing myself to do it. Otherwise my brain is all about symmetry and monochromatic. LOL! Thanks for your kind words and for playing along! Hey hostess with the most-ess! That focal definitely deserves to be on its own! It is an awesome bead. Love the colors of your piece, as well as the asymetry. This was a great challenge and I am looking forward to next month's. LOVE your necklace! I can't wait to see March's challenge. A HUGE thanks to you and your husband for sharing this challenge with us.